Adequate control of the task connected with the measurement of the noise of the technical equipment requires the combination of 3 base components. The first attribute (from three) which is seen as most important, very often mistakenly, is the measuring equipment. But the best measuring equipment is useless without an experienced technician. This technician is the second necessary attribute for successful measurement. The last attribute, very often neglected, are the measurement settings where the measuring is done. 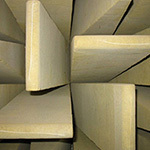 Company TALPA-RPF, in co-operation with VŠB TECHNICAL UNIVERSITY Ostrava, engages in construction of unique acoustic labs, so called ANECHOIC CHAMBERS or SEMI ANECHOIC CHAMBERS. These labs are top acoustic sites which adhere to ISO3754 and provide measurement to the highest class of accuracy. The first aim is the insulating of the measured object from exterior sources of noise (background noise) which has, for the huge spectrum of the measured objects, cardinal importance. Especially when measured objects are relatively silent (electric equipment, computers, etc.). The acoustic surrounding of the anechoic chamber, which company TALPA-RPF provides, offers a level of exterior noise (LpB) less than 15 dB(A), which is for most applications more than sufficient. When the customer has a special need for extremely low background noise it is possible to reduce it more. 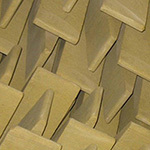 The second advantage of the anechoic or semi anechoic chamber is the free acoustic field (the acoustic field without reflections). The acoustic field generated by the measured source of the noise, which is situated in the middle of the chamber, radiates through the space of the chamber to the acoustic cones, where almost none is reflected back. The measurement is done in the free acoustic field and there is no interference with the reflected acoustic signal. 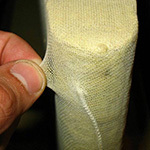 Acoustic cones, which dissipate the acoustic energy, are produced from the very porous material which is especially absorptive. The surface treatment of cones is made in the way to have maximal stability, lifetime and precise look. The depth of the acoustic cones corresponds to the basic physical principles. It means that they correspond to the wave length of the lowest measured frequency and mostly the depth of the cone is 0,4 – 1,1 m. When there is a special need for the measuring of the extremely low frequencies there is no problem to produce longer acoustic cones. Regarding the long years of experience of our company TALPA-RPF, we can say that we offer the top solution for acoustic labs with conditions for measuring to the highest level of accuracy. The mark TALPA-RPF is the guarantee of high class service. Company TALPA-RPF has the following certifications: ISO 9001, ISO 14001, OHSAS 18001 a SA 8000. Click to the look into the certification - PDF format (Adobe Reader).